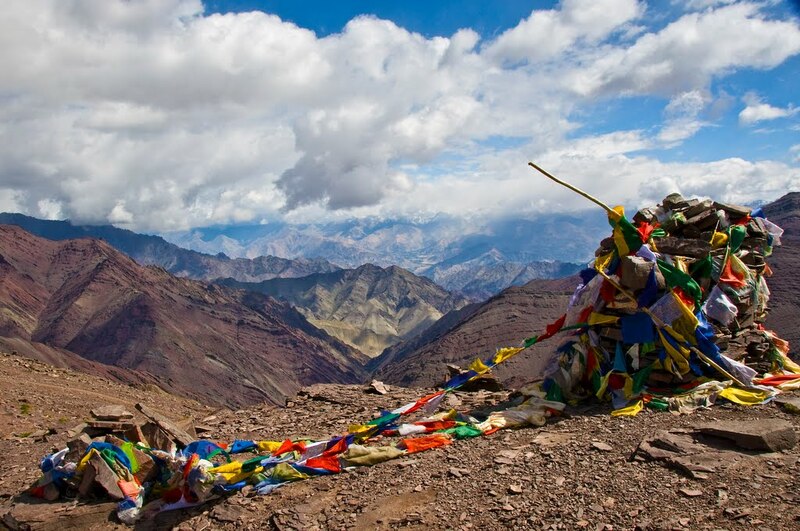 A beautiful but demanding trek undertaken by a handful of trekkers each year. Phitse La (5400 meters) and Baralacha La (5000 meters) are two high passes which takes you to Lahaul over Zanskar and close to fascinating Chandratal Lake. The lake got its name because of its crescent shape. 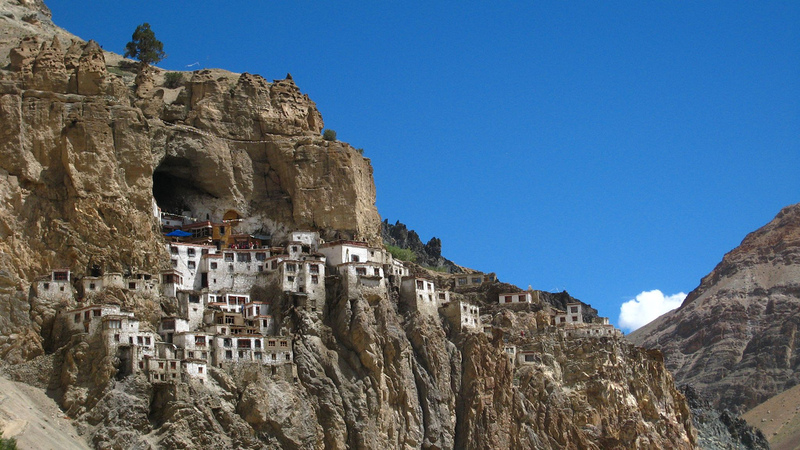 It is believed, Chandratal was discovered by traders who came to the region from Tibet or Ladakh. The sweet water lake is around 2.5 km wide. 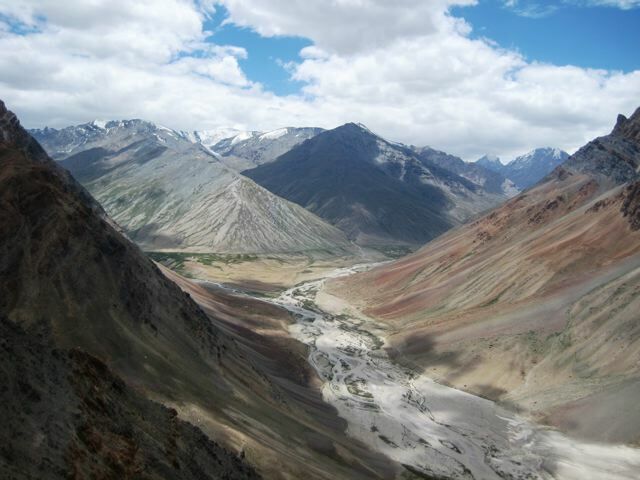 Essential its a wilderness trek and offers panoramic views of the rugged Zanskar Ranges and Lingti Plains. Along with it you can feast your eyes with the unparalleled beauty of this landscape, unique in many respect compared to the other Himalayan treks. The clear blue sky and the rugged brown rolling mountains, almost treeless, form a picture perfect image. This landscape goes on for miles interspersed with lush green meadows, and the sparkling river down below. On reaching Baralacha La, we can proceed towards Chandratal and head towards Manali and Kullu Valley via Rohtang Pass on our vehicles. The serenity and spiritual solace are an experience of a life time. Baralacha La is a high plateau where three different mountain ranges - Pir Panjal, Zanskar and the Great Himalayas - meet at an altitude above 16,000 feet. This mountain pass, one of the highest passes in Ladakh is around 73 kilometers away from Keylong on Manali - Leh road. The valley below Purne is Kargyak and houses a number of settlements and villages. We will get a chance to walk over snow laden fields and glaciers. As we head down towards the river and cross the bridge, the trail slowly ascends above the river. We cross a settlement and reach the fertile plateau and village of Tetha. Will stop over for rest and lunch before heading towards a well marked trail among beautiful views and Shanti Stupas welcoming us on the way as we reach Karu. Where stone walls are lined to direct visitors towards the trek which serves as a double purpose to protect against unwanted animals in the fields. A few kilometers ahead we cross over the river over a bridge towards Tanze village. There is a willow plantation done on a large scale in an enclosure sponsored by the J&K Forest Deptt. We camp below the village tonight. There is a fine view of Kargyak Valley once we ascend over the top of Tanze Village. There are beautiful views of high ridges and hanging glaciers ornamenting the magnificient Zanskar Range. We ascend steeply over a gorge for 500 meters before we reach a plateau where the views are even more amazing defining route to Upper Kargyak Valley back to Purne. After rest and refreshements we move ahead for a few kilometers until we reach another great camping side defining fine views. We can stop over and have lunch here. We continue up ascending the valley for 6 kilometers until we meet a river crossing. There is another river crossing few kilometers ahead of this point and then our campsite an hours walk from here. We camp here tonight after a tiring day, have sumptous dinner and rest for the difficult journey ahead. Today will be a challenging day as we will be crossing a very high pass. Thus we make an early start as we will be traversing along the outer rim of Zanskar Range. In 3-4 hourse after a challenging climb over scree and snow we would reach to the pass. The pass holds beautiful views to the Peaks of Himalayas and over Kargyak Valley. Towards North, we get to enjoy beautiful views of Zanskar Ranges. There are magnificient views of Hanging Glaciers and Zanskar Range once we climb the nearby ridge over the pass. For the descent we follow the course of the stream flowing from the pass on steep slopes over scree and moraines. We will walk slowly over snow as beautiful wildflowers surviving at ridiculous high altitude amid snow greets us. There is a long steep descent which we carefully negotiate to reach our campsite at Chumik Marpo (4750 meters). We get to rest close to the meadows filled with grazing Yaks and beautiful pastures. We have a hearty meals and retire in our tents after the long journey. Today will be a relatively easy day as we will be traversing mostly through Lingti Plains. Although we have to make an early start to cross a river while the water levels are low. We descend the trail on our left and reach an impressive gorge. The trails fall steeply from here over a river crossing into the main gorge over a major tributary. Now this needs to be negotiated with care as its a major tributary of Lingti River and is usually overflowing. We will ropes and the guide will find a proper spot where the water is shallow for us to cross the river safely. Now the Lingti Plains will start and we will cross a number of abandoned settlements adorned with Mani Walls (Inscripted Stone Walls) in loose shape and a few river crossings to reach our campsite at Lingti. The trail will be over scree and mildly irritating juniper bushes. However there are a lot of beautiful campsites here as we retire in our tents amongst beautiful start, bonfire and delicious dinner. Today will be the last day of our trek as we have reach the border between J&K and Himachal. If tired we can continue most of the journey on cars, however if willing we can continue over trek to Baralacha La and Chandratal. In 11 kilometers we will reach Manali-Leh Road at Kelong Sarai, where we can rest and have meals at nearby eateries. We can continue our trek over Baralacha Pass and Chandratal which will be another 7 kilometers. Else we can retire in comfort of our jeeps to take you on the trip to Baralacha La and Chandra Tal before heading to Keylong/Manali.